This product is out of stock. 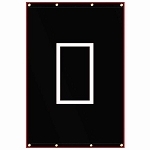 You may wish to purchase an in-stock product - our Cimarron 4' x 6' Rubber Backstop with Target. As much as we would all like to think that we can hit the ball every time it is pitched, alas, quite a few swings and misses occur. After awhile, this can lead to a hole forming in the batting cage net right behind the hitter. Batting cage nets aren't cheap; protect yours with this 4 foot by 6 foot Cimarron Vinyl Backstop. Featuring a catcher image target, the Cimarron Vinyl backstop is great for protecting your cage and it makes an excellent target for practicing pitching, too. With four sets of grommets, it's super easy to clip this vinyl batting cage backstop to your net. Portable, too, you can roll it up and use it with any cage or net. THE CIMARRON GUARANTEE: Cimarron Sports guarantees 100% satisfaction with your Vinyl Backstop. Products may be returned for a refund within 31 days of the date the product was shipped to you, when returned in accordance with the Cimarron Sports policies outlined in the Shipping & Returns section of this website. 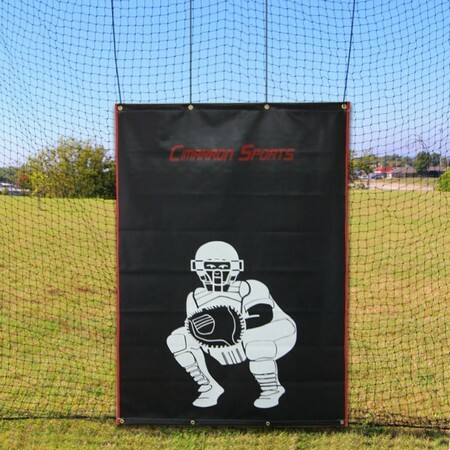 WARRANTY: Cimarron Sports warranties this backstop with a minimum 1-year limited warranty against manufacturing, materials, workmanship defects. We will enthusiastically replace or repair your product at our discretion. For full details, please read the Cimarron Sports section of the Shipping & Returns page. No matter where you order a 4 foot by 6 foot Cimarron Vinyl Backstop from, NOBODY actually stocks them; they all ship directly from the manufacturer's warehouse located in Tulsa, Oklahoma. Therefore, the shipping time frame is exactly the same no matter what website you order from (we hope that it is this one!). Cimarron Vinyl Backstops typically take 3-5 business days to ship from the time you place your order. They ship via United Parcel Service (UPS) and could take anywhere from a day or two to a week to get to you AFTER being shipped, depending on your proximity to their warehouse. We will notify you of your tracking number the moment we receive it from the manufacturer's warehouse. Expedited delivery may be available and you can certainly contact us to see what the cost would be for special one day or two day delivery. Be forewarned; it is extremely expensive, generally costs more than the backstop, itself, does and still does not affect the processing time. In other words, it will still take the same time for the warehouse to process the order; it will just get to you faster once it is shipped!